Hail damage to a roof can be devastating and very costly. 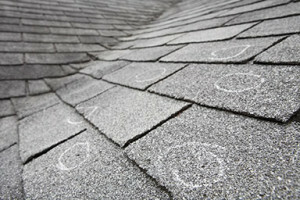 If you have had a recent storm that produced hail you should inspect your roof for hail damage. The first thing folks think is “how do I know if my roof has been damaged by hail?” Most roof damage due to hail can’t be seen from the ground. A close inspection on the roof of the shingles is required. Call a professional roofing contractor, call Metropolitan Design/Build (301) 870-2145 right away to have your roof inspected. The damage to your roof from hail is seen as dimples in the roof’s shingles or a darkened bruised spots. These dimples and bruises can cause cracks and holes in the roofing shingle which leads to water leaks and more damage to your house. Recent hail damage may have a shiny appearance because the roofing shingle was just exposed and not dulled by the weather and UV light. Hail storms also cause the granules on the roof shingle to fall off prematurely exposing the roofing shingle to the UV and shortening its lifespan. When enough granules are banged off by the hail the shingle can become brittle, crack, and curl on the edges causing roof leaks. It takes a specially trained roof inspector to see the effects of a hail storm on a roof this is why a trusted licensed professional is needed. You have insurance on your house to protect you from losses to your property’s value due to damage that is beyond your control. When your roof is damaged by hail you now have a roof that may have been expected to last 20 years that now is damaged and may be reduced to only 5-7 years of useful life. Your insurance company should compensate you for your loss and replace your roof. If you believe you have hail damage call us first! We will come out and perform a free roof inspection and provide you the results of our findings right away. We have working relationships will all the major insurance companies and can help you place your claim. Most times our roofing inspectors at Metropolitan Design/Build will be at your property the day your insurance adjusters arrives to inspect the roof alongside your insurance adjuster. We are on your side and will work with your insurance adjuster to do ensure you are treated fairly. During a roofing inspection, the adjuster and roofing contractor will make out an area in a square type pattern and then count the number of hail strikes within this area. The number of hail hits may vary due to the slope and different insurance companies have different policies. Usually, 8 hits in the area is the number they are looking for to claim a total replacement. But, remember every roof is different and not all hail damage is the same. The adjuster and contractor will normally take pictures of the damage for their records and will provide you with them as a source of record. Timing… if you are at home while a hail storm is hitting, you should document the hail storm. In today’s world most everyone has a phone and on that phone is a camera. Use it! Take pictures of the hail on the ground, use an object alongside some of the hail stones to provide a good reference for the size of the hail document the length of the hail storm. Remember to be safe during a storm it is important that you not put yourself in any danger during a powerful storm that can cause damaging hail. Keep records of weather reports as evidence that your roof did experience a hail storm event. If for any reason the hail storm is ever questioned you can provide this proof of the hail storm. If you have experienced a recent hail storm and need an experienced roofing contractor, Metropolitan Design/Build is ready at the drop of a hat. 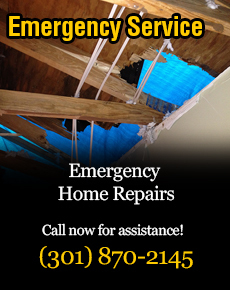 We provide emergency roofing services and can help you protect your home from further damage. Bottom line… if you have a roofing question or emergency, call us and we will be there by your side and will take good care of you and your roofing needs.